We are DEBT FREE! Thanks, Dave Ramsey! I have been waiting to write this post for a LONG time. I can’t believe it’s actually here! As of 9:00 AM on Tuesday, November 9th, 2008, we paid off our last debt, Sallie Mae, and are now officially DEBT FREE! This video is our story about how Dave Ramsey encouraged us to take control of our finances and the resources that the Lord entrusts to us. My wife has a better blog record of our financial journey than I do, including the day we met with the financial adviser from church and started this process, the day we finally paid off the credit cards, and her debt-free post from this week. Now, here we are and we don’t owe a dime to anyone. Instead of sending our paychecks to other people (with interest), we get to use what God has blessed us with to bless others and our future family. It really is an amazing feeling to be in control of your money, to eliminate financial stress, and to be good stewards of the resources God provides, no matter how large or how small they might be. The process was very difficult for me, especially since Dana and I live on a youth pastor salary. Our bare bones monthly budget hardly balanced with my income! But as we started they journey in obedience to Him, the Lord really honored that and blessed us beyond our dreams. Over the course of the year, a got a raise at church and a health insurance situation that increased my income by $10,000 per year. Plus, the Lord provided work for Dana, prompted random people to give us financial gifts, my website started making money (even though it’s all free), and He gave us discipline to live on very tight budget: no eating out, no seeing movies, limited travel, and saying “no” to things that normally would cause us to splurge. It was tough, but as Dave Ramsey says, “Live like no one else, so later you can live like no one else,” and that’s exactly what we did! A lot of people criticized our plan. Debt is unfortunately such a normal part of the American psyche that most people never consider what life might be like without it. Many “smart investor” people also told us that’s it’s foolish to pay off debt for many different reasons. The funny part is, they’re all broke! I’ll never take financial advice from a broke person! If they lost their jobs, they’d quickly start missing payments and within months would be filing for bankruptcy. Owing different companies a lot of money does not make you rich nor financially secure. In fact, this entire world would be a very different place if people followed this simple plan: Spend less than you make! Dana and I paid off $21,521.66 in 15 months. When we started we estimated it would take over 2 years. Obviously, we did it in about half that time, not because we have a huge income, but because God blessed us once we started getting on track with our finances. Our next steps are to save an emergency fund of 3-6 months worth of expenses. Once that is complete, we’ll start investing, saving for retirement, and especially saving for a down-payment on a house. Mathematically it will take us 2 or 3 years until we’re in a position to buy a house, but God has already proven that math doesn’t work right when He’s involved with the finances — He blesses like crazy! I know he’ll do the same for you! 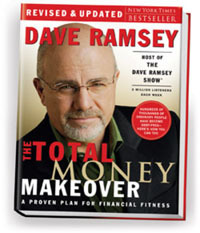 Start by reading Dave Ramsey’s book, Total Money Makeover and checking out his website at DaveRamsey.com. I also HIGHLY recommend subscribing to his free podcast in iTunes and listening to 40 minutes of his radio show (commercial free) as your time permits. It will change your life.